Norman Osborn as Green Goblin, art by Luke Ross. The Green Goblin is the alias of several fictional supervillains appearing in American comic books published by Marvel Comics, mostly those starring Spider-Man. The first and best known incarnation is Norman Osborn, who was created by Stan Lee and Steve Ditko in The Amazing Spider-Man #14. The Green Goblin is a Halloween-themed supervillain whose weapons resemble bats, ghosts and jack-o'-lanterns. Comics journalist and historian Mike Conroy writes of the character: "Of all the costumed villains who've plagued Spider-Man over the years, the most flat-out unhinged and terrifying of them all is the Green Goblin." The Green Goblin has appeared in several films including 2002's Spider-Man as Norman Osborn, and 2007's Spider-Man 3 and 2014's The Amazing Spider-Man 2 as Harry Osborn, Norman's embittered son. The Green Goblin debuted in The Amazing Spider-Man #14. At this time his identity was unknown, but he proved popular and reappeared in later issues, which made a point of his secret identity. According to both Stan Lee and John Romita, Sr., who replaced Ditko as the title's artist, Lee always wanted the Green Goblin to be someone Peter Parker knew, while Ditko wanted his civilian identity to be someone who hadn't yet been introduced. Lee elaborated: "At some point we had to tell the reader who The Green Goblin really was. And Steve wanted him to turn out to be just some character that we had never seen before. Because, he said, in real life, very often a villain turns out to be somebody that you never knew. And I felt that that would be wrong. I felt, in a sense, it would be like cheating the reader. ... if it's somebody you didn't know and had never seen, then what was the point of following all the clues? I think that frustrates the reader. So that was a big argument we had." However, Ditko's account contradicts Lee's: "So I had to have some definite ideas: who he was, his profession and how he fit into the Spider-Man story world. I was even going to use an earlier, planted character associated with J. Jonah Jameson: he [was to] be [revealed as] the Green Goblin. It was like a subplot working its way until it was ready to play an active role." In the landmark story "The Night Gwen Stacy Died" (The Amazing Spider-Man #121-122), the Green Goblin kills Gwen Stacy and later perishes in a fight against Spider-Man. However, the story's writer, Gerry Conway, had Harry Osborn adopt the Green Goblin identity in the aftermath of "The Night Gwen Stacy Died", later remarking that "I never had any intention of getting rid of the Green Goblin as a concept". Several other characters would take on the Green Goblin identity, and writer Roger Stern later introduced the Hobgoblin to replace the Green Goblin as Spider-Man's archenemy. In addition, a retcon during the "Clone Saga" determined that the original Green Goblin survived the events of The Amazing Spider-Man #122 and had been playing a behind-the-scenes role in Spider-Man's adventures since then. Norman Osborn is the main character connected with the alias who developed the equipment used by the other Green Goblins ever since he was exposed to the Goblin Formula. Harry Osborn, Norman Osborn's son, becomes the second Green Goblin. After being defeated and placed under the care of Dr. Bart Hamilton, Harry while under hypnosis reveals many Green Goblin secrets and Hamilton decides to become the third Green Goblin. Harry recovers and fights Hamilton until an explosion renders Harry amnesiac of his time as the Green Goblin and kills Hamilton. Years later, Harry's memories return and he uses a new stronger Goblin serum to augment his power, but dies from it. Harry would later return thanks to the machinations of Mephisto in "One More Day". Dr. Barton "Bart" Hamilton was a psychologist born in Scarsdale, New York. Before his death, Harry is put under the medical care of Dr. Hamilton, who manages to make Harry bury his vendetta and identity as the Goblin in his subconscious via hypnosis. Dr. Hamilton uses Harry's secrets to become the third Green Goblin. However, Harry has no knowledge of where the Green Goblin strength-enhancing formula is, and Hamilton is thus unable to locate it. He hatches an elaborate plot to kill Silvermane, but Harry Osborn resumes the Green Goblin identity to stop him. They battle and Hamilton is accidentally killed by a bomb with which he meant to kill Spider-Man, and Harry becomes amnesiac. Years later, there was speculation that Hamilton was the Hobgoblin but this is disproved. A Green Goblin that is presumably Hamilton appears as a member of the second incarnation of the Legion of the Unliving, created by the Grandmaster. After being pitted against the Avengers, the group and their master are vanquished by Death. During the Dead No More: The Clone Conspiracy storyline, Bart Hamilton's Green Goblin form is cloned by Miles Warren and his company New U Technologies. After Harry's insanity relapses and he becomes the Green Goblin again on numerous occasions until he dies from the side effects of a modified Goblin serum, his equipment and the Green Goblin identity are then briefly used by Philip Benjamin "Phil" Urich (nephew of Ben Urich of the Daily Bugle) trying to gain a reputation as a superhero, although he is sometimes seen as being as maniacal as his villainous predecessors. When his equipment is damaged during a battle against a Sentinel in the Onslaught crossover, Phil is unable to repair or replace it and the fourth Green Goblin thereafter retires. He later forms the team Excelsior. Currently Phil has become the new Hobgoblin, but after being caught by Spider-Man he is broken out of jail and becomes the Goblin Knight a servant of the Green Goblin. After returning from the dead, Norman begins trying to convince the public that he was never the Green Goblin, so he has an associate named Doctor Angst genetically engineer a new Green Goblin, one slavishly devoted to him, to help his case. Norman uses the Goblin as a bodyguard, to torment Spider-Man, and in ploys (such as kidnapping Normie Osborn for ransom) designed to draw public sympathy. After Norman is incapacitated by the Gathering of Five, the Goblin is left alone, and begins to degenerate due to no longer having access to the formula required to keep him stable. The Goblin goes after Harry Osborn's wife Liz Allan in a desperate bid to find a cure for his condition, but is driven off by Spider-Man. During a second attempt to capture Liz, the Goblin unmasks himself in front of Spider-Man (shuffling through a variety of faces, the most prominent being Harry, after doing so) and melts into a pile of goo as he claims Norman would return. In his first appearances, the Green Goblin seems to be a normal man (albeit very nimble and athletic) who gets his powers from his many gadgets. In later appearances, it is established that due to the "Goblin Formula", Norman and any successor to the Goblin persona possesses superhuman strength (lifting 9 tons under optimal conditions), increased speed, reflexes, endurance, and healing rate. Though much slower than the likes of Wolverine, he can regenerate damaged tissue and organs. His intelligence has been enhanced to gifted levels, though at the price of his sanity. His involvement with the Gathering of the Five loosened his grip on reality, though he is able to maintain his sanity via chemically treated dermal patches. When not impaired by mental illness, Osborn is a cunning businessman, masterful strategist, and highly skilled in electronics, mechanics, engineering and chemistry. The Green Goblin is armed with a variety of bizarre devices. He travels on his bat-shaped "Goblin Glider", an incredibly fast and maneuverable rocket glider equipped with various armaments. Other weapons the Goblin uses include incendiary Pumpkin Bombs, smoke- and gas-emitting grenades resembling ghosts and jack-'o'-lanterns, razor-edged boomerang-like throwing weapons called razor bats and gloves woven with micro-circuited filaments which channel pulsed discharges of electricity at nearly 10,000 volts. He wears a green costume underneath bulletproof chainmail with an overlapping purple tunic. His mask has a built-in gas filter to keep him safe from his own gasses. In the Green Goblin's first appearance in "The Amazing Spider-Man" #14, he rides a steel, rocket powered wingless broomstick, not a glider. In issue #17, his second appearance, he changes it to the familiar bat-shaped glider. The Goblin Glider's controls and microprocessor are located behind the head of the glider. The pilot is attached to the glider via electromagnetic clasps on the wings of the glider. It has great maneuverability and is steered mostly by leaning, but manual controls are available behind the head of the glider. The Green Goblin later added radio-linked voice controls to his mask. Its top speed is 90 miles per hour (140 km/h), and it can support about 400 lb (180 kg), though it could lift far more for brief periods. Flying at top speed with a full load and a full fuel tank would deplete its fuel supply in about an hour. In the Goblin's later appearances, the glider possesses a wide array of armaments, including heat-seeking and smart missiles, machine guns, extending blades, a flamethrower and a pumpkin bomb dispenser/launcher. Pumpkin Bombs, Ghost Bombs, and the "Bag of Tricks"
A grenade used by the Green Goblin, the Pumpkin Bomb resembles a miniature Jack-o'-lantern and, when thrown, ignites almost soundlessly and produces enough heat to melt through a 3-inch (76 mm) thick sheet of steel. The Goblin carries these and a variety of other weapons, such as razor bats (akin to bladed boomerangs) and miniature "Ghost Bombs" in an over-the-shoulder satchel he calls his "Bag Of Tricks". 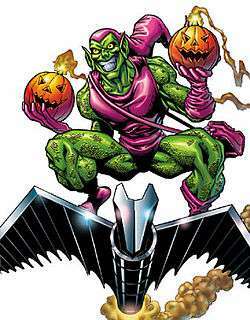 The Green Goblin has a range of other "Pumpkin Bombs" and "Ghost Bombs" at his disposal, including smoke-and gas-emitting bombs. Some release hallucinogenic gases, while others emit a specially-created mixture that neutralizes Spider-Man's spider-sense for a limited period of time. Still others emit a flame-retarding gas, which the Goblin uses against the Human Torch. All of these are covered in a light plastic coating. Some time after Harry's death, his son Normie is abducted by a trio of mysterious female Goblins. With the aid of Ben Urich and Molten Man, Spider-Man discovers that these "Goblinettes" are robots created by Harry, and controlled by a supercomputer containing copies of Harry and Norman's minds. The Goblinettes are destroyed along with the computer, which had been programmed to expose Normie to the same version of the Goblin Serum that killed Harry, in attempt to create a new Green Goblin. An offshoot of the Scriers cult founded by Norman, consisting of only his most loyal followers. Following Norman Osborn's rise and fall from power, a number of Goblin Gangs sprang up across America. Composed mostly of white supremacists who agreed with his plans to remove the Asgardians from the country, they wear purple clothes, green face makeup and have goblin-based tattoos. Vin Gonzales was revealed to have received one of these tattoos while in prison when he passed a message from Norman to Harry about Stanley, Harry's newborn son. The Goblin Underground is a group of organized crime composed of Goblin-themed villains led by Goblin King against their nemesis Spider-Man. In the eight month timeskip that occurred subsequent to the events of Secret Wars, a heavily bandaged arms dealer claiming to be Norman Osborn began selling Green Goblin-based costumes and equipment on the black market, establishing private armies of "War Goblins". As a fictional character, the Green Goblin has appeared in a number of media, from comic books to films and television series. Each version of the character is typically established within its own continuity within parallel universes, to the point where distinct differences in the portrayal of the character can be identified. Various versions of the Goblin are depicted in works such as Marvel's Ultimate line and Earth X. The Green Goblin has appeared in many Spider-Man related media. ↑ Manning, Matthew K.; Gilbert, Laura, ed. (2012). "1960s". Spider-Man Chronicle Celebrating 50 Years of Web-Slinging. Dorling Kindersley. p. 26. ISBN 978-0756692360. 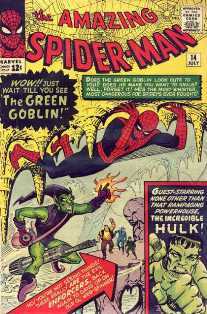 Spider-Man's arch nemesis, the Green Goblin, as introduced to readers as the 'most dangerous foe Spidey's ever fought.' Writer Stan Lee and artist Steve Ditko had no way of knowing how true that statement would prove to be in the coming years. ↑ Williams, Scott E. (October 2010). "Gerry Conway: Everything but the Gwen Stacy Sink". Back Issue!. TwoMorrows Publishing (44): 14. ↑ "The Amazing Spider-Man", issue #17.